Keynote speaker Terry Smith, Andrew W. Mellon Professor of Contemporary Art Theory, Department of History of Art and Architecture, University of Pittsburgh; Professor, Division of Philosophy, Art and Critical Thought, European Graduate School addressing the audience at 'Art and Action: Contemporary Art and Discourse in Southeast Asia'. Image courtesy of LASALLE College of the Arts (photo by Ken Cheong). 'Art and Action: Contemporary Art and Discourse in Southeast Asia' is Singapore's first major international conference on contemporary art histories of the region. The conference was hosted by LASALLE College of the Arts Singapore from 3 to 5 December 2018, and aimed to advance the knowledge and writing of recent art histories. This is a relatively new field, as noted by Jeffrey Say, Programme Leader of LASALLE's MA Asian Art Histories, one of the event's co-conveners alongside curator Iola Lenzi. The event was structured around seven panel discussions with topics ranging from the use of tradition in contemporary practices to artists' engagement with the city and the role comics play in dissemination. Papers presented various methodologies into research, historicisation and interpretation. Terry Smith, Professor at the University of Pittsburgh and the European Graduate School, cited his keynote lecture the aspirations of artists in the 1970s "to do art history as art, do revisionist radical art history in a work of art, thus demonstrating art historical insights as works of art." It was a statement made within the context of brave manifestoes by individuals such as Redza Piyadasa who was an artist, art critic and historian from Malaysia. Smith's presentation also brought up the implications of a global art biennale circuit for artists from the region, at a time where there are no longer art centres beyond their function as trading hubs. 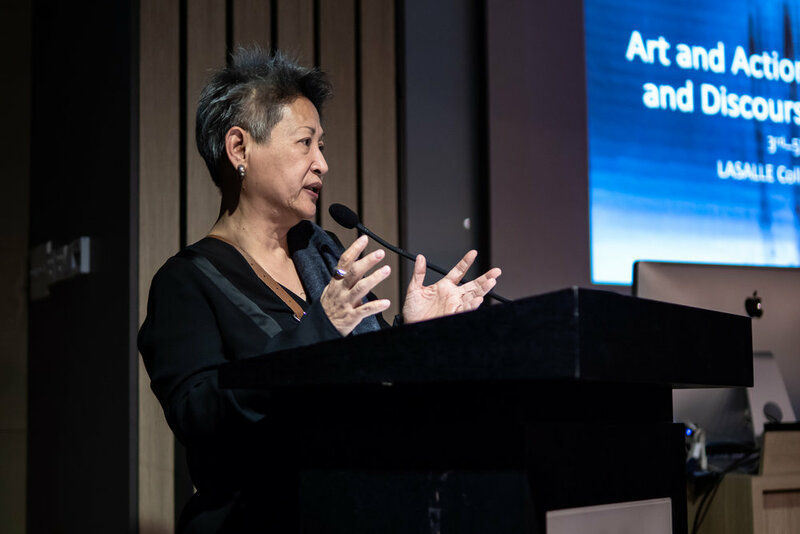 Marian Pastor Roces, Independent Curator and Critic, delivering her keynote address titled 'Conceptual Art and Authoritarianism in 1970s Southeast Asia'.Image courtesy of LASALLE College of the Arts (photo by Ken Cheong). Yet this decentering entails a global consciousness and sensitivity towards a multiplicity of cultures. Mapping out the connections between self-ascribed Conceptual Art and authoritarianism in the 1970s, independent curator and critic Marian Pastor Roces spoke of context building in the form of a "bigger picture" network. Her presentation evidenced the urgency of our current political climate, while shifting modes between biography from her time working at the Cultural Centre of the Philippines and macro observations. Roces looks back at that historical moment as an inquiry towards the possibility of art's engagement with political developments today and what that might mean for contemporary practices. The growing interest in Thai artist and poet Tang Chang's oeuvre is indicative of how present concerns shape the lens through which history is recovered and revised. Chang recently had his first solo exhibition outside of Thailand, titled 'The Painting that is Painted with Poetry is Profoundly Beautiful' at the Smart Museum of Art, University of Chicago curated by Orianna Cacchione, as well as a presentation at the 12th Shanghai Biennale 2018. Speaking about Chang's rejection of the art market and mainstream art scene, Cacchione suggested that it was a politics of reclusion where the artist sought to cultivate his own audience outside of the state's use of art as a tool for modernisation. Chanon Kenji Praepipatmongkol from the Museum of Contemporary Art Chicago, offered a complementary perspective that read the opacity of Chang's concrete poems and late landscape paintings within the narrative of Thailand's muddled history after the 1976 Thammasat University massacre. Artists Panel at 'Art and Action: Contemporary Art and Discourse in Southeast Asia'. From left to right: Sally J. Clarke, Curator and Arts Writer; Founder, Asian Arts Advisory (Singapore); Arahmaiani (Indonesia); Yee I-Lann (Malaysia); Imelda Cajipe Endaya (Philippines); and S. Chandrasekaran (Singapore). Image courtesy of LASALLE College of the Arts (photo by Ken Cheong). The conference title 'Art and Action' aptly captured the key concerns of contemporary art discourse in Southeast Asia, in a manner where social action takes into consideration geopolitical history, power structures of institutions and the market, as well as the artist's complicity. Just as Roces questioned the assumed radicality of 1970s "Conceptual" Art from the region, Thomas Berghuis addressed the use of categories and terminologies in the process of historicisation. In particular, his paper examined roots of performance art in Indonesia which rose from multifaceted practices of action, art and performance. The three-day event closed with an artist panel featuring Arahmaiani, S. Chandrasekaran, Imelda Cajipe Endaya and Yee I-Lann. It was a particularly poignant gesture that emphasised how the art remains at the core of it all, that perhaps the last word still lies with artists.